The 25th Division was formed from the 27th and 35th Infantry regiments of the original Hawaiian Division− a pre–World War II composed of two brigades with four infantry regiments. The remaining units of the Hawaiian Division were reorganized as the 24th Infantry Division. These steps, part of the Triangular division organization, were undertaken to provide more flexibility with direct division control of three regiments. After the Japanese air attack on Schofield Barracks on 7 December 1941, the 25th Infantry Division moved to beach positions for the defense of Honolulu and Ewa Point. Following intensive training, the 25th began moving to Guadalcanal, 25 November 1942, to relieve Marines near Henderson Field. First elements landed near the Tenaru River, 17 December 1942, and entered combat, 10 January 1943, participating in the seizure of Kokumbona and the reduction of the Mount Austen Pocket in some of the bitterest fighting of the Pacific campaign. The threat of large enemy attacks caused a temporary withdrawal, but Division elements under XIV Corps control relieved the 147th Infantry and took over the advance on Cape Esperance. The junction of these elements with Americal Division forces near the cape, 5 February 1943, ended organized enemy resistance. The division landed in the San Fabian area of Luzon on 11 January 1945 to enter the struggle for the liberation of the Philippines. It drove across the Luzon Central Plain, meeting the enemy at Binalonan, 17 January. Moving through the rice paddies, the 25th occupied Umingan, Lupao, and San Jose and destroyed a great part of the Japanese armor on Luzon. On 21 February, the division began operations in the Caraballo Mountains. It fought its way along Highway No. 5, taking Digdig, Putlan, and Kapintalan against fierce Japanese counterattacks and took Balete Pass, 13 May, and opened the gateway to the Cagayan Valley, 27 May, with the capture of Santa Fe. Until 30 June, when the division was relieved, it carried out mopping-up activities. On 1 July, the division moved to Tarlac for training, leaving for Japan, 20 September. The Korean War began on 25 June 1950 when the North Korean Korean People's Army (KPA) crossed the 38th Parallel to invade South Korea. Acting under United Nations (UN) orders, the Division moved from its base in Japan to Korea between 5–18 July 1950 to join the Eighth United States Army. The division, then under the command of Major General William B. Kean, successfully completed its first mission by blocking the approaches to the port city Pusan. For this action, the Division received its first Republic of Korea Presidential Unit Citation. The division participated in the breakout from the Pusan perimeter commencing on 16 September and Eighth Army then began a general offensive northward against crumbling KPA opposition to establish contact with forces of the 7th Infantry Division driving southward from the Inchon beachhead. Major elements of the KPA were destroyed and cut off in this aggressive penetration; the link-up was effected south of Suwon on 26 September. On 23 September the Division was assigned to the newly activated US IX Corps. The UN offensive was continued northwards, past Seoul, and across the 38th Parallel into North Korea on 1 October. The momentum of the attack was maintained, and the race to the North Korean capital, Pyongyang, ended on 19 October when elements of the Republic of Korea Army (ROK) 1st Infantry Division and US 1st Cavalry Division captured the city. The advance continued, but against unexpectedly stiffening resistance. The Chinese People's Volunteer Army (PVA) entered the war on the side of North Korea, making their first attacks in late October. The UN forces renewed their offensive on 24 November before being stopped by the PVA Second Phase Offensive starting on 25 November. The division was forced to carry out a systematic withdrawal and ordered to take up defensive positions on the south bank of the Chongchon River on 30 November 1950. Eventually, these lines failed and Eighth Army suffering heavy casualties, ordered a complete withdrawal to the Imjin River, near the 38th Parallel. After a month and a half of planning and reorganization, a new offensive was launched on 25 January 1951, and succeeded in recapturing Inchon and Kimpo Air Base. This was the first of several successful assaults on the PVA/KPA. The division next participated in Operation Ripper, during which it drove the PVA across the Han River. Success continued with Operations Dauntless and Piledriver in early 1951. These offensives secured part of the Iron Triangle which enhanced the UN's bargaining position. With leaders of four nations now at the negotiating tables in the summer of 1951, Division activity slowed to patrol and defensive actions to maintain the line of resistance. This type of action continued into the winter of 1952. In January 1953 the Division was transferred from IX Corps to I Corps and assumed the responsibility of guarding the approaches of Seoul on 5 May 1953. 23 days later, when ceasefire negotiations at Panmunjom stalled, a heavy PVA assault hit the Nevada Complex, the Division held its ground; the brunt of the attack was absorbed by the attached Turkish Brigade and the 14th Infantry Regiment. By successfully defending Seoul from continued attack from May to July 1953, the division earned its second Republic of Korea Presidential Unit Citation. Again negotiators moved toward peace. In July, the division again moved to reserve status at Camp Casey where it remained through the signing of the armistice 27 July 1953. Fourteen division soldiers were awarded Medals of Honor during the Korean War, making the division one of the most decorated US Army divisions of that war. On 1 February 1957, the division was reorganized as a Pentomic Division. The division’s three infantry regiments (the 14th, 27th and 35th) were inactivated, with their elements reorganized into five infantry battle groups (the 1-14 IN, 1-27 IN, 1-35 IN, 2-19 IN and the 2-21 IN). In August 1963, the division was reorganized as a Reorganization Objective Army Division (ROAD). Three Brigade Headquarters were activated and Infantry units were reorganized into battalions. In response to a MACV request, the division deployed the 3rd Brigade, a Reinforced Task Force, with 5,150 infantrymen and 9,000 tons of equipment from Hawaii in 25 days to the Northwest sector of South Vietnam to firmly establish a fortified enclave from which the division could operate. Operation Blue Light was the largest and longest airlift of personnel and cargo into a combat zone in military history before Operation Desert Shield. The brigade deployed its first soldiers from Hickam Air Force Base, Honolulu, to the central highlands at Pleiku. These men arrived in Vietnam 24 December 1965. By mid-January, the deployment operation was complete — giving combat planners in Vietnam a favorable balance of power. The division was heavily engaged from April 1966 until 1972 throughout the area of operations in Southeast Asia. 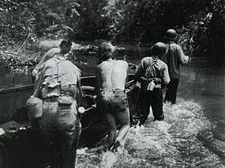 During this period, Tropic Lightning soldiers fought in some of the toughest battles of the war including Operation Junction City. After its return to Schofield Barracks, the 25th Infantry Division remained the only Army division to have never been stationed in the continental United States. In a time of overall military downsizing, it was reduced to a single brigade numbering 4,000 men. The division was reactivated in March 1972. It was reorganized to include as a "roundout" brigade the 29th Infantry Brigade of the Hawaii Army National Guard which included: the 2nd Battalion, 299th Infantry, Hawaii Army National Guard; 100th Battalion, 442d Infantry, US Army Reserve; and the 1st Battalion, 184th Infantry California Army National Guard. Now reorganized, the 25th Infantry Division trained for the next eight years throughout the Pacific Theater and continued to improve its combat capabilities with troop deployment varying in size from squads, who participated in training missions with Fijian forces, to exercises as large as Team Spirit, where more than 5,000 divisional troops and 1,700 pieces of equipment were airlifted to South Korea for this annual exercise. In June–August 2009, elements of the 25th Division participated in Operation Champion Sword. On April 7, 2017, military.com reported that U.S. Army announced the deployment of approximately 1,500 soldiers the 4th Brigade Combat Team to Afghanistan as part of Operation Freedom's Sentinel later in the year. 3rd Battalion, 21st Infantry Regiment "Gimlets"
1st Battalion, 24th Infantry Regiment "Legionnaires"
2nd Battalion, 8th Field Artillery Regiment (2-8th FAR) "Automatic"
1st Battalion, 21st Infantry Regiment "Gimlets"
3rd Battalion, 7th Field Artillery Regiment (3-7th FAR) "Steel"
325th Brigade Support Battalion (325th BSB) "Mustangs"
2nd Battalion (Airborne), 377th Field Artillery Regiment (2-377th FAR) "Spartan Steel"
725th Brigade Support Battalion (725th BSB) "Centurion"
2nd Squadron, 6th Cavalry Regiment (AH-64) "Lightning Horse"
1st Battalion, 25th Aviation Regiment (AH-64) "Arctic Attack"
209th Aviation Support Battalion (209th ASB) "Lobos"
PFC Baker, John F., Jr.
1LT Warren, John E., Jr.
SSG Bowen, Hammett L., Jr.
Rapper/actor Ice-T served in the 25th Infantry Division. Oliver Stone served in the 25th Infantry Division during the Vietnam War. Country music singer/actor George Strait served in the 25th Infantry Division as an infantryman from 1971 to 1975. The film Tropic Thunder takes its' title from the unit's nickname as a possible homage to Platoon. The 1953 Academy Award–winning movie From Here to Eternity depicts scenes and troop housing billets of Schofield Barracks, Hawaii, where the Division has been located since its formation as a US Army unit in August 1941. ^ "Special Unit Designations". United States Army Center of Military History. 21 April 2010. Archived from the original on 9 June 2010. Retrieved 24 June 2010. ^ "Headquarters and Headquarters Battalion, 25th Infantry Division; Lineage and Honors". U.S. Army Center of Military History. 26 August 2014. Retrieved 26 January 2015. ^ Wilson, John B. (25 August 1999). Armies, Corps, Divisions, and Separate Brigades. Army Lineage Series. Government Printing Office. p. 295. ISBN 0-16-049992-5. LCCN 98-52151. Retrieved 29 October 2012. ^ Operation Champion Sword Archived 22 September 2015 at the Wayback Machine Archived 22 September 2015 at the Wayback Machine, Alaska Post, Volume 16, Number 31, 7 August 2009. Retrieved 22 June 2016. ^ Winstead, Matthew (1 December 2011). "3,500 Soldiers of 4th Brigade Combat Team (Airborne), 25th Infantry Division, deploy for year in Afghanistan". Joint Base Elmendorf-Richardson. Retrieved 26 January 2015. ^ Schroeder, Daniel (24 November 2011). "25th CAB bids farewell during deployment ceremony". Hawaii Army Weekly. Retrieved 26 January 2015. ^ Schroeder, Daniel (30 March 2012). "'Pathfinders' tackle drug routes during joint ANCOP SWAT mission". Hawaii Army Weekly. Retrieved 26 January 2015. ^ U.S. Army (7 January 2013). "Final Flight". Flickr. Retrieved 26 January 2015. ^ 3rd Brigade Combat Team, 25th Infantry Division Public Affairs Office (6 April 2012). "3rd BCT comes home just in time for Easter". Hawaii Army Weekly. Retrieved 26 January 2015. 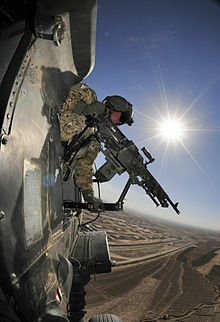 ^ U.S. Army (6 October 2012). "Welcome home kiss". Flickr. Retrieved 26 January 2015. ^ "Army Announces Deployment of 1,500 Alaska-Based Troops". military.com. 7 April 2017. ^ "Army to pair National Guard, Reserve units with active-duty units". stripes.com. Retrieved 20 March 2018. ^ Affairs, Sgt. 1st Class Jeff Lowry 38th Infantry Division Public. "National Guard soldiers switch patches, align with active-duty division". greensburgdailynews.com. Retrieved 20 March 2018. ^ 10 July 2015 (10 July 2015). "Army lays out plan to cut 40,000 soldiers". Armytimes.com. Retrieved 13 October 2015. ^ "Army Announces Delayed Conversion of Alaska Airborne Brigade". army.mil. Retrieved 20 March 2018. ^ Judson, Jen (8 August 2017). "Milley: 4-25 IBCT To Stay in Alaska for at Least a Year". defensenews.com. Retrieved 20 March 2018. ^ "25th Infantry Division, Division Commanders". United States Army Center of Military History. 2 March 2007. Archived from the original on 25 April 2008. Retrieved 20 March 2015. ^ a b c Comegno, Carol (18 January 2010). "N.J. soldier honored with 'Soldier's Medal' for heroism". Courier-Post (N.J.). Retrieved 21 January 2010. [dead link] For a photo of the statue, see Photo gallery. Asbury Park Press (N.J.). Retrieved 27 January 2010.